Mortgages are like weeds. You pay it down monthly, but it never seems to go away. 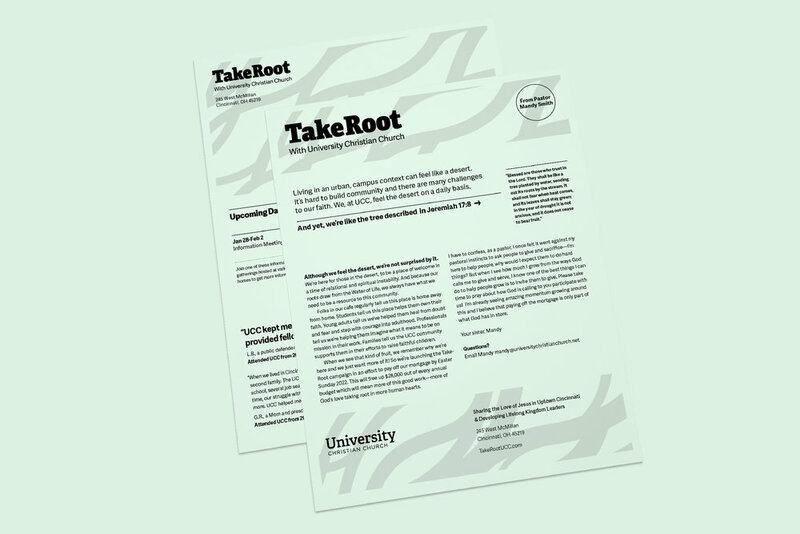 TakeRoot is a campaign led by University Christian Church (UCC) to raise $350,000 over three years to pay off its building’s remaining mortgage. I go to church at UCC and was asked to work on the campaign’s marketing team along with my good friend, Seth Lucas (wayfinding and environmental designer at University of Cincinnati). Together, Seth and I created the visual identity including the name, wordmark, illustrations, and collateral materials. The strategy for the campaign was led by Rick Vilardo of TC Ministries. The verse often used during the campaign was Jeremiah 17:8-8, “Blessed is the one who trusts in the Lord, whose confidence is in him. They will be like a tree planted by the water that sends out its roots by the stream. It does not fear when heat comes; its leaves are always green. It has no worries in a year of drought and never fails to bear fruit.” It’s that imagery of deep connection to the true abundance that directed the name of the campaign. Greater than paying off the mortgage, the campaign sought to foster these words of Jeremiah in the UCC community. All of the elements of the identity, from the paper selection to the background graphics express a movement away from the lies of scarcity, toward the belief in the truest abundance available regardless of our bank statement. 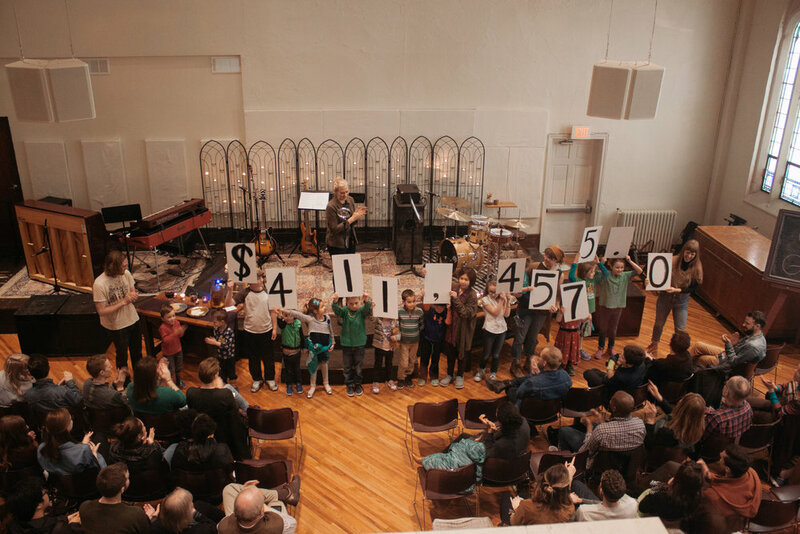 While the campaign is only in the first month of its first year, the UCC congregation and its supporters have already pledged over $400,000 to pay off the mortgage. That’s even more than we had hoped! Now, you may be wondering why this is a big deal? The current monthly mortgage hinders our church from dreaming about new and creative expressions of our faith. For instance, Rohs Street Cafe, a warm and welcoming coffee shop is one of our current ministries. We’re excited to imagine what else we can come up with as our monthly budget becomes less of a constraint. Regardless of the success of the campaign, it was a pleasure to work on the campaign identity with Seth and the rest of the TakeRoot team. I actually said no initially to help out, but I’m glad I changed my mind.